On November 24, 2004, DeWaun King went to work at Modern Homes (manufactured housing plant) in Mobile, Alabama. DeWaun was a saw operator responsible for operating the computer that would dictate how the wood was cut by the industrial saw. The saw was manufactured by Alpine Engineered Products (Defendant) and was installed at Modern Homes approximately two years prior to the incident. The saw was equipped with several 18-inch steel diameter blades that were manufactured by Simonds International (Defendant). At some point during the day, the bolts holding the blade to the mandrel broke off during operation of the saw thereby allowing the blade to come out of the saw and strike DeWaun in the leg. As a result of the incident, DeWaun sustained an open distal femur fracture that required surgery. He was left with a permanent impairment to his leg. It was alleged in the lawsuit that the 18-inch steel diameter saw blade was defectively designed and manufactured in that the countersink holes (holes where the bolts feed through) were oversized thereby causing excessive vibration and pressure on the bolts, which ultimately led to the failure. The defendants countered and suggested that the bolt failure was due to over tightening of the bolts during the blade change process and was the fault of the workers at Modern Homes. The case was tried in April of 2008 and a Mobile County jury returned a verdict in favor of DeWaun King in the amount of $1.6 million against Simonds and Alpine. The clients' child was born with, among other things, Tracheal and Bronchiomalacia. This condition prevented the child from inhaling like normal healthy children, although he could exhale breaths normally. With appropriate surgical intervention at age 4 or 5, the prognosis for the child was "good". During the child's first years of life, however, the child was required to breathe with use of a home ventilation system which was provided by a Birmingham, Alabama medical equipment provider. On or about the child's first birthday, the child's equipment failed in the middle of the night, allowing the child to suffer massive brain injury which eventually required the parents to withdraw life support a few days later. The lawyers of the firm brought suit against the equipment provider that was responsible for maintaining and servicing the ventilation system in a timely manner as it was the alleged failure of this company to properly maintain and service the ventilation system that caused the death of the child. The case was set to be tried in Blount County, Alabama. Wrongful death confidential settlement for the Plaintiffs. A 17 year old schizophrenic child murdered his parents and attacked 3 of his 4 minor siblings in a small community in Alabama. Filed in 2000, lawyers from the firm represented the siblings (through their guardians) and pursued a claim against the child's psychologist and multiple pharmaceutical companies. Lawyers for the firm asserted a negative connection between the child's underlying psychiatric condition and the drugs he ingested -- arguing additional warnings should have been provided by the pharmaceutical companies. After extensive litigation, the case was resolved in 2003. The defendants denied any liability. Settlement for Plaintiffs for a confidential amount. Mary Knight was driving her grandchildren to Disney World, traveling on I-20 in Birmingham in her 1995 Ford Aerostar, which was equipped with tires produced by a popular manufacturer. The left front tire blew out, causing Ms. Knight to lose control of the vehicle, which struck the guardrail as it left the roadway and collided with a tree, causing serious injury to Ms. Knight and her grandchildren. In a similar case, after it was determined that the manufacturer allowed defective tires to leave its manufacturing plants for sale to the public, a repository of documents relating to the manufacturing process was established. Following an extensive exchange of motions designed to access the document repository, the case was mediated to a confidential settlement in August 2003. Confidential Settlement for the Plaintiffs. 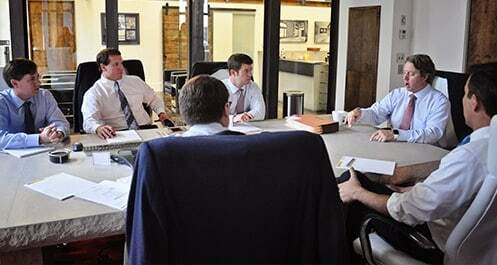 The defendants settled the matter, confidentially, at mediation prior to the trial of the case. Kevin Kite and a friend were traveling in a 1999 Jeep Wrangler at approximately 60 mph, when the vehicle lost control and rolled over, end over end. Mr. Kite was in the front passenger seat when the vehicle rolled. The seat back on the Wrangler collapsed due to a rear impact during the first roll. The roll bar, which held the attachment point for a portion of the seatbelt, shifted forward approximately 7 inches. The combination of the seat collapse and roll bar movement effectively removed the seatbelt from Mr. Kite, permitting him to be ejected. State Trooper photographs at the scene of the accident showed the buckle latched, but no one in the seat. The suit filed on behalf of Mr. Kite alleged that the seat back and roll bar system were defectively designed and not sufficiently crashworthy in a foreseeable rollover collision. Mr. Kite lost his left leg, and had multiple fractures throughout his body. Daimler Chrysler and Don Drennon settled the matter, confidentially, at mediation prior to the trial of the case. A 15-year-old front seat passenger was brain injured in an automobile accident. As alleged, the 15-year-old female passenger was seat belted during the accident, but her seatbelt did not properly restrain her allowing her head to come into contact with a deploying airbag. Defendants disputed that the 15-year-old girl was seat belted at the time of the accident. Plaintiffs presented testimony from multiple eyewitnesses that substantiated that the 15-year-old girl was seat belted. Additionally, Plaintiffs used downloaded vehicle "black box" information at trial to substantiate that the accident was of sufficient intensity to cause the seatbelt retractor mechanism to "lock up", which would have prevented the child's head from being "out of position" and coming into contact with the deploying airbag. Attorneys for Hollis Wright also pursued a claim on behalf of the minor girl's parents for loss of consortium due to the brain injury. The case was tried before a Jefferson County jury in February 2005. During trial, the case resolved for a confidential amount.